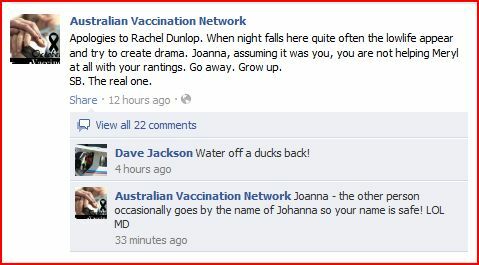 (Or, the rise of the AVN troll; therefore, it must be StopAVN). In January 2011 a new AVN Facebook admin arrived on the scene. Susan Butler (not her real name) is an old friend of Meryl Dorey, and they had recently had the pleasure of spending some quality time together. Susan agreed to act as an admin on the AVN page due, in part, to her incorrect belief that the AVN was under attack from a group that had the silencing of free speech as its intent. Now, Susan is no idiot. She is an academic, and has shown that she is well across the subjects on which she comments. She understands stats, as has been demonstrated. Susan provides accurate and reputable information in response to regular AVNers. She displays calmness and intelligence in the face of grossly inaccurate claims and conspiracy nonsense which are the staple of the AVN diet. Susan regularly posts evidence-based comments which highlight the misleading nature of her friend’s agenda. Strangely, Susan has never done this to any of Meryl Dorey’s claims. Nor has Dorey ever laid down some burning stupid to counter any evidence presented by Susan. Put simply, the appearance of Susan on the AVN page is an exercise in public relations. She is there to provide a semblance of sanity to the AVN. SAVN frequently congratulates Susan for her honesty and integrity in responding to demonstrable nonsense, for the most part. This attempt at sanity, however, has had some blowback. Susan is seen as a hostile presence by many AVN supporters, as was expected. However, there are some serious questions hanging over Susan’s aforementioned integrity. It should be noted, however, that Susan is decent: Susan at least had the decency to publicly apologise to people who were impersonated and vilified on the AVN page, as will be shown. If only her long time friend, Dorey, had just a shred of this decency. Documents showing how Susan has demonstrated that Meryl Dorey is a liar can be found here and here. 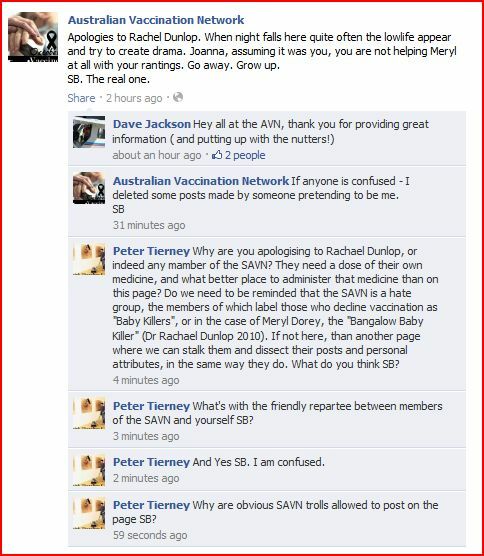 Meryl Dorey and the AVN troll and supporter Johanna Holland: background. Johanna Holland is a fake profile of a coward who has been vilifying the McCaffery Family and members of Stop the AVN for over two years. Holland has created a network of imaginary friends used in an attempt to intimidate anyone who it sees as a threat to the cult of anti-vaccination, especially the cult of the AVN. As of writing, Holland has created: at least 21 fake profiles under which it operates as a sockpuppet; at least 14 fake Facebook pages set up to vilify and impersonate SAVN members; at least 64 fake profiles set up to impersonate SAVN members and anyone else it sees as a threat (including some legitimate AVN supporters it perceived as anathema to AVN policy); a YouTube channel set up to defame and vilify a grieving family, SAVN members and their family and friends (including children). The document I have of the URLs of Holland fake profiles, email addresses and IP addresses runs to nine pages (no screenshots; just URLs and addresses). This is one seriously ill person. We have our own Mabus. Documents showing some of the activities of Holland can be found here, here and here. There are seven more documents of the activities of Holland which I have left unpublished, as they are being saved for another purpose. Meryl Dorey is acutely aware of the presence and activities of Holland. Dorey has used screenshots, provided by Holland via email to Dorey, in her blog post, “True Colours”. Meryl Dorey and Johanna Holland were Facebook friends for a very long time. Johanna Holland had free rein on the AVN page for a very long time, ably assisted by similarly paranoid AVN admins. Dorey has admitted, via third-party emails in which I have been engaged (which I will not publish), that she is acutely aware of Holland, and that Holland is no longer welcome on the AVN page. Quite simply, I suspect Dorey knows the identity of Holland. A fateful day for Meryl Dorey and the AVN. hatred of Susan Butler. Holland has attacked Susan before, on the AVN page, under various fake profiles; but, this: this was something to behold. In the course of the morning Holland had created a fake AVN page under which to comment; two fake Peter Tierney pages; a fake Rachael Dunlop page; a fake Dave Jackson page (whose only sin was to mention that it was good that Susan had deleted the “nutters”); and, a fake Katherine Delly page (Katherine was a legitimate AVNer who had been impersonated by Holland and vilified by AVN admins, over a year ago). This was an explosion of special. The attack on Susan Butler was pure rage and spite. The attack on SAVN members was similar. The eventual response from Meryl Dorey was so predictable, I wish I had have taken up the private bet made that Dorey would blame SAVN for the activities of Holland. Dorey didn’t disappoint: we know her well. interspersed with Susan Butler’s responses; some commentary; the expected deceitful response from Meryl Dorey; the expected acquiescence from Dorey’s acolytes who responded to Dorey’s dog-whistling with precision; the subterfuge of Dorey grabbing the opportunity to attack SAVN, based upon her own deceit; and, the depositing of a truckload of faecal disrespect on to her long time friend, by Dorey the ideologue. This was a black day for honesty on the AVN, even for the AVN’s usual low standards. By this time the real Susan Butler had come across the posts. The posts, of which there were many more than shown here, had been up for hours. The fake Dave Jackson also made the above paranoid quote, once the fake Tierney comment was deleted and banned. 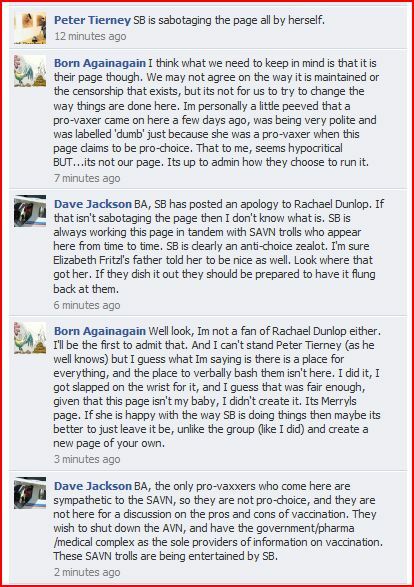 So, the fake Dave continued with the anti-Susan rant, ably assisted by another coward by the name Born Againagain, accusing Susan of sabotaging the AVN page, by apologising to Rachael Dunlop. Things just got weird. This line of attack went on for quite some time. I won’t bore you with all of it. It is all of the same conspiracy stuff already noted, with an undying hatred of all things Susan Butler and SAVN. But, where was Meryl Dorey? How would Dorey respond? We had a pretty good idea. Dorey finally made an appearance, after her friend had been dragged through the mud by someone with whom Meryl Dorey is very familiar. Dorey makes a comment on the attacks on the AVN page: who does she insinuate has carried out these attacks? SAVN…of course. “If you are anti-choice you are displaying how low your group will descend”: Meryl Dorey knows this is Holland. 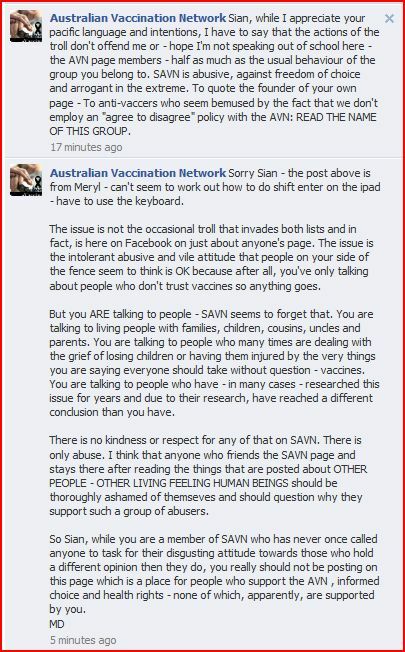 Meryl Dorey implies that SAVN is responsible. Meryl Dorey initiates the first step in vilifying a group of people for something she knows was perpetrated by someone she knows and who is one of her most ardent supporters. On the same post, over several hours, Dorey hypes the acolytes, running with the concocted premise that SAVN staged the attack on the AVN page. The acolytes respond, thinking that SAVN was, indeed, responsible. Dorey does not correct them. Dorey adds to their hysteria, further insinuating that the evil SAVN are, well, evil. The deed is done. She has convinced her acolytes that SAVN was responsible for the vileness on the AVN page, and responsible for the vileness exacted upon her friend, Susan Butler. “I have to say that the actions of the troll don’t offend me”. Holland attacked her friend by impersonating her, vilifying her, and accusing her of sabotaging the AVN page, whilst Dorey stood by and did nothing. 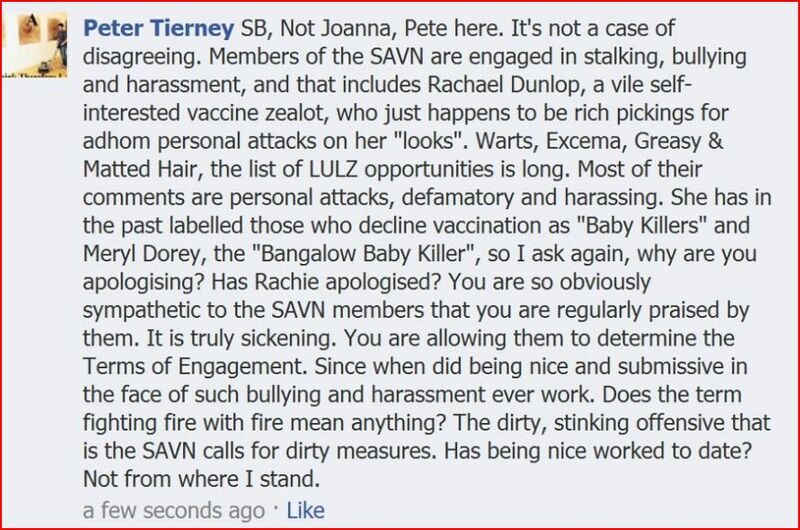 Then, Dorey throws her friend under the bus, in the name of downplaying the actions of, and protecting, one of the most cowardly, vile and cruel anti-vaccine activists we have seen so far. Friends? What friends. Ideology comes first, and a friend who presents rational, evidence-based and calm commentary is disposable. One is forced to wonder out loud why Dorey is so protective of Johanna Holland. 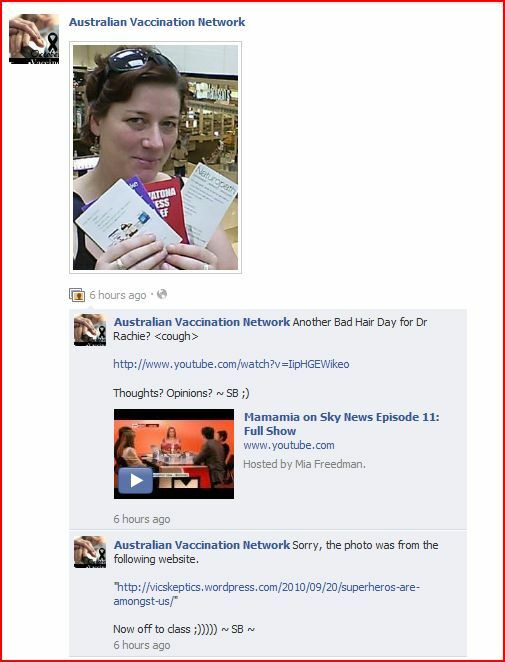 This entry was posted in anti-vaccination dishonesty, australian vaccination network, AVN, meryl dorey, skeptic, stop the australian vaccination network, vaccination and tagged anti vaccination, australian vaccination network, AVN, harassment, meryl dorey, troll, vilification. Bookmark the permalink. 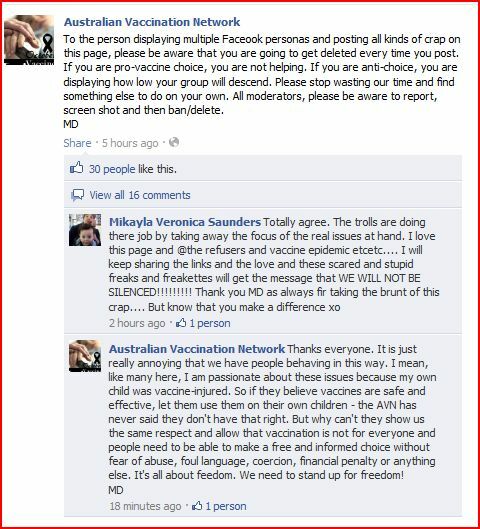 0 Responses to Meryl Dorey is not offended by antivax attacks on her friend. 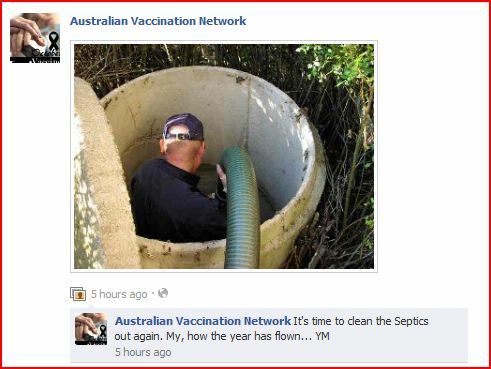 So both Susan Butler and Meryl Dorey post under the name “Australian Vaccination Network” and it’s only when they sign their posts that we have any idea who they are purporting to be? And this troll can use the same name with impunity? I don’t use Facebook. Is this some kind of facebook thing where you can be anybody you want to be? Anyone can create a fake personal profile, fake fan page etc, and set it up to look the same as the one it is impersonating. The only difference will be that you can tell which one is real, and which is fake, by checking out the URL. 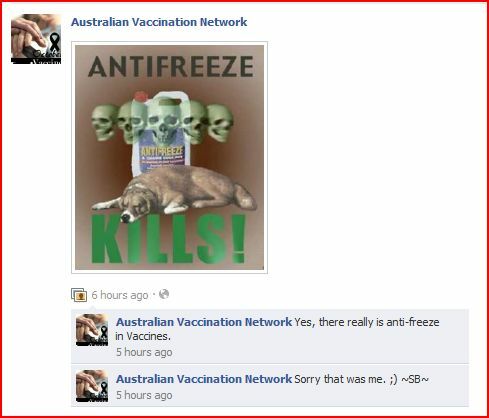 On most fan pages there will be multiple approved moderators (admins) who have the authority to post under the page name (ie: Australian Vaccination Network). We were able to see immediately that the AVN fake was indeed a fake by clicking to the home page of the fake, which showed it was an imposter. I have had 11 fake profiles set up to impersonate me, by this same troll. This was before the two fake fan pages which appeared in the circumstances noted in the above post. It has a thing for me. Of note, it appears that Susan Butler has left the AVN page in disgust. This was bound to happen, and no one can blame her given the shoddy treatment she received from people she was attempting to portray as sane. Holland seems to be the relative kept in the upstairs room at Meryl’s place. Fed macadamia nuts and raw beef carcases. Your dedication to detail is amazing. All I can really maintain – throughout all this, for so darn long now – is Dorey appears to be a Significant Other of Holland. Gawd. We all learned a lot from Mabuse. What a sad, lonely and potentially dangerous one Holland is. I don’t even know where to start – Kudos to you Peter and other SAVN’r for screencapping ll this and putting the jigsaw together. And again my already low respect for that Repugnant Dorey is lowered another notch. So, is the identity of this troll known? No need to mention a name, but I am curious if anyone had made an ID. I am genuinely concerned about this Johanna Holland. She seems to be seriously deranged. How can she be stopped?